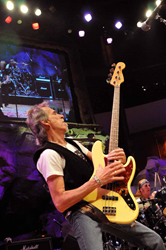 Craig MacGregor, long-time bassist for the classic rock band Foghat, is seeking to raise awareness for patient safety by supporting legislation that would require patients to be directly informed of their medical test results. He then asked me what treatment I had received for my lung tumor. I had no idea what he was talking about. Craig MacGregor, long-time bassist for the classic rock band Foghat, is seeking to raise awareness for patient safety by supporting legislation that would require patients to be directly informed of their medical test results. MacGregor, who has been battling stage 4 lung cancer since 2015, learned that he had the advanced disease more than three years after doctors had originally discovered it during an emergency room visit. Unfortunately, those test results were never communicated to MacGregor. Craig, who joined Foghat in 1975, was touring with the band when he learned of his diagnosis. "I went to an orthopedic doctor about leg pain. He looked into my medical history and discovered a CAT scan report from my 2012 emergency room visit. He then asked me what treatment I had received for my lung tumor. I had no idea what he was talking about. So we did another CAT scan and learned that the small 10mm tumor identified in 2012 had now grown almost seven times in size." Further testing confirmed that MacGregor had inoperable stage 4 lung cancer with metastasis to the brain. The Patient Test Results Information Act (PA House Bill 1233) seeks to provide a safety net to patients by putting forward a law that would require medical test providers to directly communicate a summary of critical test result findings to patients, which in turn may save lives. The Bill's primary sponsor, Representative Marguerite Quinn has been advocating for this law for many years. MacGregor is hoping that by sharing his story, that he can help to raise awareness for the proposed legislation and patient safety, so he has launched a petition on Change.org. Sophisticated diagnostic tests can reveal critical health information. But what good is that test if you never learn the results? "My situation was completely preventable, and now I'm faced with a terminal illness due to hospital and doctor failures." says MacGregor. "If this law were in effect, then I would have known about the tumor and could have sought treatment, or been cured. I just don't want to see this happen to anyone else." According to a recent research study by John Hopkins Medicine that was published by BMJ, medical errors are third leading cause of death in the US, behind heart disease and cancer. Since his diagnosis, MacGregor has been receiving aggressive chemotherapy and radiation treatments. He and his wife have filed a civil lawsuit against the treating hospital and five others that were involved with his care. Craig MacGregor is the well-known bassist for the classic rock band FOGHAT, recognized for their hit songs "Slow Ride" and "Fool for the City." Prior to his diagnosis in 2015, Craig was actively touring and recording with Foghat. He is now at home in the Reading, PA area and is undergoing treatment at a Philadelphia cancer hospital. Pennsylvania House Bill 1233 was unanimously passed by the House in 2015. It is now being considered by the PA Public Health and Welfare Committee. The Bill's primary sponsor is Pennsylvania State Representative Marguerite Quinn.